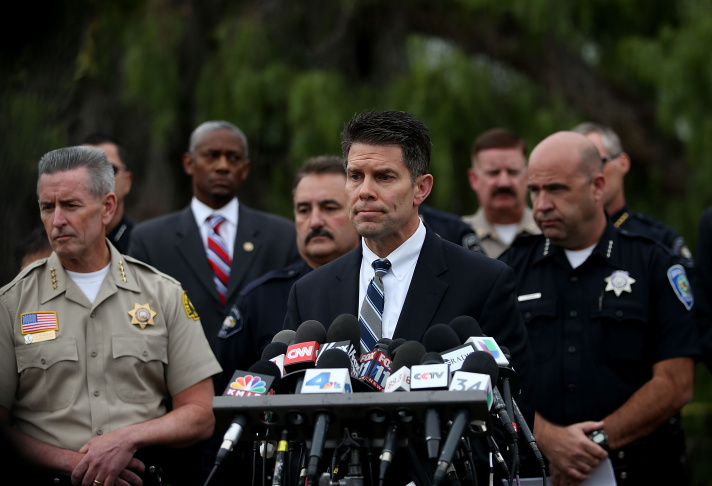 Displays shared by the FBI at a press conference on the San Bernardino shootings on Tuesday, Jan. 5, 2016. 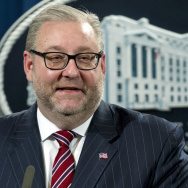 File: Federal Bureau of Investigation assistant director David Bowdich speaks during a news conference on Dec. 4, 2015 in San Bernardino. The FBI is asking for the public’s help in locating the San Bernardino shooters during a “missing 18 minutes” after the attack that left 14 people dead last month. “It's critical,” said David Bowdich, assistant acting director of the FBI’s Los Angeles field office. Agents are focused on 12:59 p.m. to 1:17 p.m. — about an hour after the attack. “It's possible that they stopped at a storage area, a residence or a business. It's possible there was a contact made” with an accomplice or someone else, Bowdich told reporters at a noon news conference at San Bernardino Police headquarters. 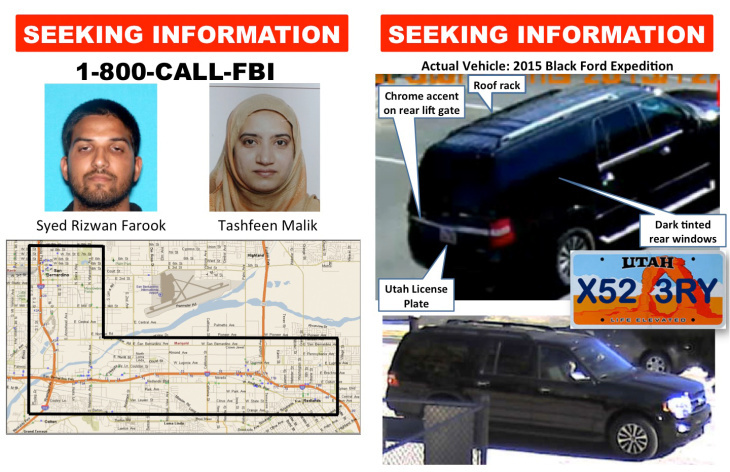 During the nearly four hours after the attack, until they were killed during a shootout, Syed Rizwan Farook and Tashfeen Malik were driving around San Bernardino and Redlands — “zigzagging” the cities and making just two stops, according to Bowdich. They made “short stops” at Lake Seccombe at 11:45 a.m. and a parking lot, he said, without naming the parking lot. 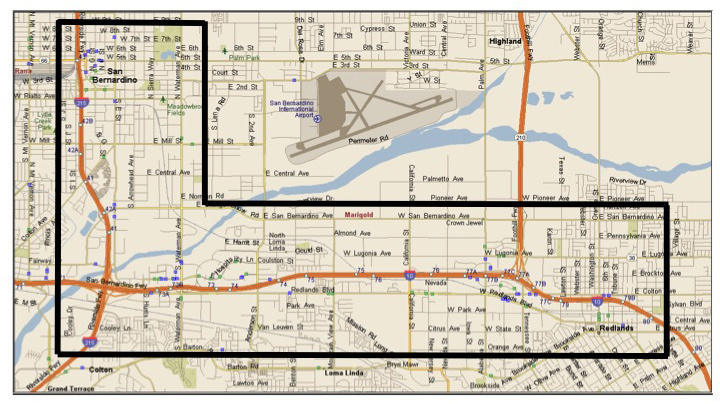 Bowdich showed a map of the area Farook and Malik were in prior to and following the shooting, saying that they traveled through Redlands and San Bernardino, going back and forth. He said there are no indications that they left the area during those missing 18 minutes. A map of the area that shooters Syed Rizwan Farook and Tashfeen Malik were in on Dec. 2, 2015. "There's no rhyme or reason that we can make for it yet. However, again, that 18 minutes is critical. We know they went and they parked at certain places, and we know they spent some time at those places. 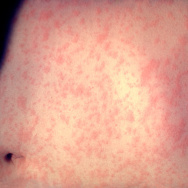 We don't know necessarily what they were doing at those places," Bowdich said. "[Their route] is very convoluted. We can essentially trace their route, and they went back and forth, and back and forth, and up and down." “They did a lot of driving around,” Bowdich said. Investigators stitched together their movements using traffic cameras, private security cameras and eyewitnesses who saw the dark SUV Farook was driving, he said. For the first time, Bowdich said FBI divers found no evidence at the lake. “We recovered a number of items at the lake — none of which to this point seem pertinent or relevant to this investigation,” he said. One official said a skateboard was among they items they found. The FBI declined to provide more details of their movements. The final shootout with police that left Farook and Malik dead occurred after a brief chase — around 3 p.m.
Federal agents have conducted more than 550 interviews, collected over 550 pieces of evidence, and executed 29 search warrants in the investigation, said Bowdich. Investigators have found no evidence the attack was directed by ISIS or other foreign groups, he said, “but we haven’t ruled that out either.” Instead, they continue to believe Farook and Malik were “inspired” by militant Islamic groups. He put to rest any accounts that a workplace dispute motivated the attack. “There was a lot of chatter early on about workplace disputes. We do not see any indications of that. We do not see any witness accounts where there was a fight or argument with Syed inside the venue,” Bowdich said. 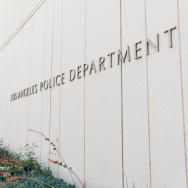 He said that there are photographs of Farook inside the venue, and that he seemed to be OK.
Bowdich said that they didn't know whether Malik was in the vehicle the entire time or not. Bowdich said that they are not aware of any secondary targets they intended to attack on that day, but that it's not out of the realm of possibility. He said it remains unknown why they chose to attack this particular target. Farook had initially brought a backpack in with him to the IRC that he left behind when he left the facility. That backpack contained the pipe bombs that were later found. Bowdich asked the public to call 1-800-CALL-FBI and use option 4 if they have any further information or video. He showed the vehicle and its license plate in case people had seen that. Authorities are seeking information from the public to help in their investigation of last month's shooting in San Bernardino that left 14 victims dead and 22 others injured. They were set to hold a press conference at the San Bernardino Police Department on Tuesday as they ask the public and, as they note in a press release, specifically the San Bernardino community for more information. 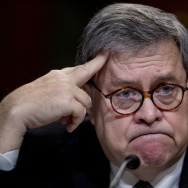 They did note that they were limited at this time from commenting on the investigation and that they were restricted from commenting on pending prosecution. Shooters Syed Rizwan Farook and his wife Tashfeen Malik were shot and killed by police in a standoff on the day of the shootings, but friend Enrique Marquez Jr. could face up to 50 years in prison for charges including ones related to buying two of the weapons used in the attacks. Representatives from the FBI, the ATF, the San Bernardino Police Department and the San Bernardino County Sheriff's Department were all set to appear at the press conference.